Sometimes we have a huge group that wants to rent the island. We’ll do this for 28 guests+ in the ‘high’ season (Dec – April, except on holiday weeks) and for 15+ guests the rest of the year (except hurricane season: Sept/Oct). 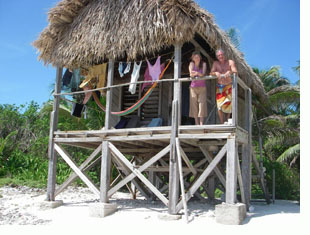 Renting the island includes all the sports gear and guides. We don’t allow our gear to be used without our staff supervision. If you want to rent the island without any sports gear at all included, you can send us an email to inquire about this possibility [slickrock(at)slickrock(dot)com]. First and foremost, our island is truly a private island. There is no one on the island but us and the dive shop. The entire Slickrock facility would be yours. This is unheard of in the Caribbean. Second, our island is as undeveloped as possible. If you come from a camping background, you would consider it cushy, but if your background and expectations are from a more traditional standpoint, you would call it “rustic”. 1 Minimums are listed in the first paragraph. We can sleep 36 in cabanas, double (and sometimes triple) occupancy. 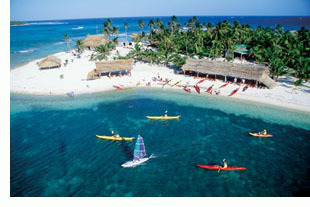 2 For groups up to 20, the cost is 18% off of our regular rate of $1975/person, which comes to $1620 each. For groups larger than 20, the discount is higher, request charter policy. Children pay the same as adults, unless you don’t need to count them towards your total to reach a certain size for a higher discount. If you wish to pay children’s rates, request our kid’s policy. 3 Free spots: one free spot for groups 15-18 paying guests, 2 free spots for 19+ paying guests. 4 This is for one week on the island, (6 full days, 2 half days, 7 nights) with hotels and restaurant meals before and after. 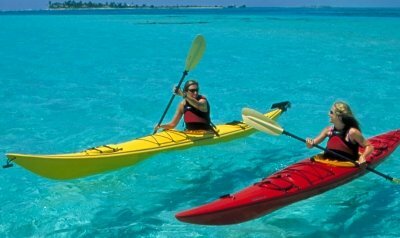 Twenty years ago when we first explored Belize’s stunning Barrier Reef looking for a new kayaking trip no one there had ever seen a sea kayak. 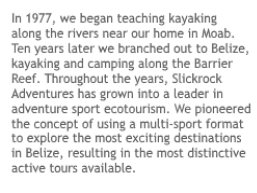 We began as a traditional sea kayak outfitter, running self-contained camping trips on islands near the coast. As this amazing country became increasingly popular with its tropical climate and idyllic reefs, we began looking for a more exclusive experience. Searching for more than just translucent turquoise water to paddle in, a given in Belize, we sought a more remote and pristine place to call home. We needed the ideal sea kayaking, diving and snorkeling environment and hoped to add other sports like surfing and windsurfing. The first time we saw 13-acre Long Caye with its forest of palms shading white sand beaches we knew we had found exactly what we wanted. What an island! We have a consistent wave break just offshore for surfers, a near-constant 12-15 knot wind for windsurfers, a private coral reef within swimming distance for snorkelers and divers, and a clear neon-blue ocean full of rays and dolphins to paddle with. We only had to build a few simple palm-thatch cabanas to transform it into a comfortable place for our clients. By keeping our development low-key and our groups small we have attained the ideal balance between comfort and the wildness of this pristine coral eco-system. This allows sea turtles to continue to nest and tropical fish to swim right up to the shore.